No, I am not making this up. Bloomsbury sent it to me in September but I’ve had to hold off on the review till publication day. And since chez moi was home during The Offspring’s childhood to a succession of guinea pigs (all conveniently named GP) I had to read it straight away. (It’s only 56 pages long, and half of those are photos. 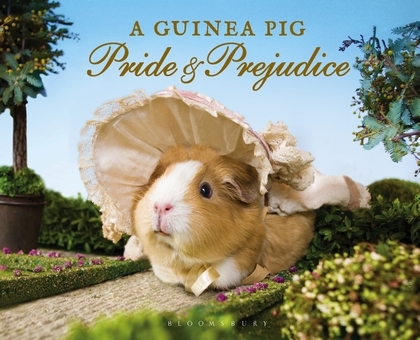 Of cute guinea pigs in Regency era costume). What would Jane Austen think? I think she’d have a good chuckle over it. No vampires, #Just thought I should reassure you. Illustrator: Tess Gammell (she drew the houses: Netherfield Park, The Parsonage and Pemberley. In bookshops from October 1st. I’ve heard that the next in the series is ‘The Guinea Pig Exorcist’ – should be fun. So it’s a book? I was linked to a youtube or something similar of it a few days ago, but didn’t realise it was a promo for a book! I guess it will get into lots of Xmas stockings this year but I hope not mine. It’s just too cutesy for words – and I didn’t see any lip from Lizzie or passion from Darcy in the images I saw!! This is hilarious! I have a coworker who has a guinea pig named Roger. I will have to tell her about this book!